Of course I forgot my camera… yesterday’s mission was to check out the world-famous Christmas market at Nuremburg. There are Christmas markets all over Munich and probably in every town in Germany, but Nuremburg’s is the oldest and biggest. We were a bit disappointed by the huge crowds, and the booths were much the same as the markets in Munich but without the charm. We did enjoy some glühwein, a potent mulled wine guaranteed to warm you up and make you cheery whatever the conditions, but it was a long way (5 hours return on the train) to go for a cup of hooch. "cult" — but a very old one dating back to the 12th century. The fellow wore a black bowler-type hat, and a suit made entirely of black suede. The pants had huge bell-bottoms that Cher would have been proud to wear, and he wore a vest with big white buttons over top of a white, collarless shirt. A double-breasted blazer with piping completed the ensemble. He carried a single bag slung over his shoulder, and a walking stick. The young fellow was a tradesman, a "journeyman" in the most literal sense of the word. 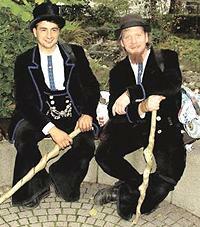 The "Auf der Walz" is an expression for "travelling on the job", a custom of guilds dating back to medieval times. Craftsmen who are members of these guilds travel around the world after their apprenticeships are finished, learning new techniques as a prelude to becoming masters of their trade. They travel with a bag containing only their clothes and their tools, and must stay at least 50km away from their hometowns for at least two years and a day. Wherever they go, master craftsmen are obliged to take them in, but they must not stay in any one place for more than three months. All must adhere to a strict code of behaviour to preserve the honour of the guild. Here is an interesting article on the Travelling Carpenter’s Guild.